Getting your kids to eat healthy, nutrient-rich foods is a struggle you'll probably go through at some point if you haven't already. Between the barrage of advertisements starring junk foods to the many phases of childhood eating (only peas one day and then no peas for weeks! 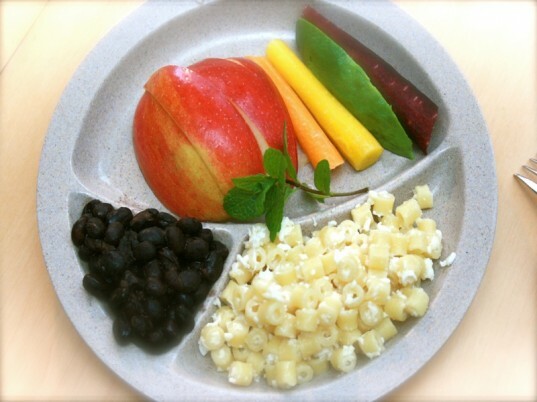 ), guiding your child on the lifelong path to nutritious eating can be confusing and frustrating. Here are seven tips to help your entire family choose nourishing foods and to eat them in a stress-free, fun environment. Remember when your baby was still on a liquid diet, and she would sit at the table, looking enviously or curiously at your plate (and your mouth) at dinnertime? Well, she’s still watching you, so set a good example – cook new dishes and include ingredients that might not be your favorite either. My parents are not fans of beets so I never even tasted them until college. Tastes are always evolving so show your kids that you have a sense of food adventure, too. It’s often hard for kids to separate why something is okay for Mom or Dad, but not for them. Take one for the team and give up your soda or post-dinner ice cream sundae habit and try replacing it with something healthier. Our family generally avoided checkout line tantrums because my son had no idea what was inside those shiny candy bar wrappers. Big brothers or sisters can be helpful in enticing younger, pickier kids to try something new. Likewise, having a dinner playdate with a peer who is known to be a “good” eater can also have a positive effect on your little one. Your kid is not going to starve if you refuse to make her a grilled cheese sandwich on white bread. Again. Nutritionists and pediatricians agree that making a separate meal for your child that features only his or her “greatest hits” isn’t doing anyone a favor. And no one has ever gone through grilled cheese withdrawal. Don’t expect that your child will eat everything you give them, but give them a variety of healthy options and then let them choose. It’s simple, and you can spend the time you would have spent cooking them another meal, doing something fun together like coloring or staying a few extra minutes at the park. Set them up for success by giving them something you know they like and then let their bellies guide them. Of course, we make exceptions to this rule occasionally, such as when I’m cooking spicy food (which many little ones have a hard time digesting). For older kids, encourage them to personalize their own meal: Offer dipping sauces, ketchup, hummus, salsa, etc. Have them test the sauces and condiments to see what they like best. In our house, a little sprinkling of vegan cheese works like fairy dust: The cheese as well as anything it makes contact with disappears! Let’s be honest. Those naked, lonely stalks of steamed broccoli thrown on the plate aren’t fooling anyone. If vegetables are treated as an afterthought, kids sense it. My family is vegan, so vegetables are usually the stars of the meal by default. If you aren’t vegan or vegetarian, you can easily incorporate veggies into the main component of a dish — think pot pie, lasagna, soups and chilis. The kids are still getting to eat their favorite foods, with an extra nutritional boost. Veggies are not second-class citizens. When well-meaning parents coax their children to eat “just one more green bean” before they can have dessert, they send the message that vegetables are something to endure, not enjoy. Check out some of the amazing cookbooks out there that focus on vegetables, from high end tomes by Alice Waters of Chez Panisse to very kid-friendly cookbooks from Molly Katzen. Depending on your child’s age, this approach can look very different. Starting a garden, even just a tomato plant, is a great way to get your kid excited about growing his own food. Being a part of the “seed to table” process is very empowering for kids, and they are much more likely to try something that they’ve literally had a hand in growing. 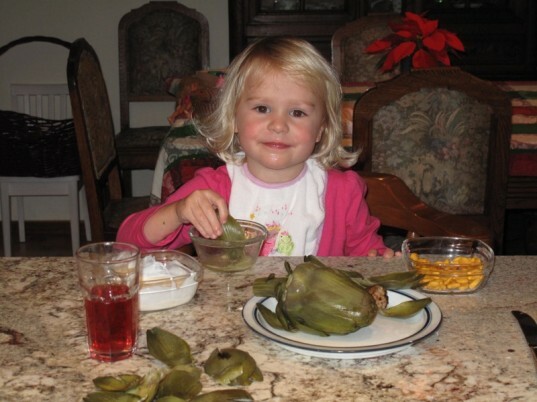 If gardening is not your thing, take your children where there is fresh food a plenty. 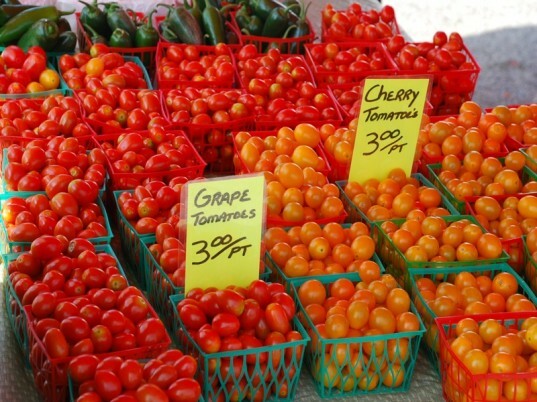 Farmer’s markets are an awesome place for kids and their parents to explore. Allow them to pick out a new fruit or vegetable to try each week. They won’t all be winners, but everyone (including Mom and Dad) may find a new favorite. You can even make a game of it with their kids: How many kinds of tomatoes do they see? How many different colors of fruit are in season? Even a trip to the grocery store’s produce section will work the same way. And don’t forget to include them in the actual cooking. My son loves being a “taster.” He doesn’t know the difference between basil and cilantro, but he loves shaking, stirring, and adding flavors to our dishes and then testing the final product. Make kids feel like they’re a part of the whole cooking process (even if it’s just pressing the “on” button to the blender). A possible side bonus: They may gain appreciation for all the work that you do. If your child refuses to even take a bite of something, don’t push — it’ll just become a battle of wits and it’s important for children to have control over their appetite. Instead, ask them what it smells like, if its shape reminds them of anything, even what it feels like. Even if no morsels pass their lips, they are developing a sensory palate that will eventually serve them well. You can make this into a game, too. Some foods (such as potatoes and cauliflowers or ricotta cheese and blended tofu) mimic each other in texture or taste. Try swapping them out in old favorites and see if kids can taste the difference. 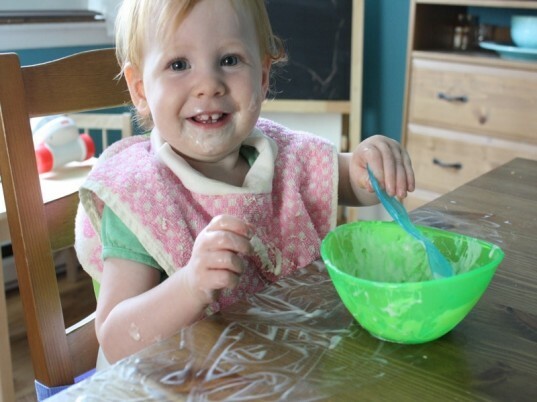 Letting kids play with their food is a controversial topic, but one worth exploring. Teach them that throwing food is not okay, but that trying new ways to eat is encouraged. Maybe mixing up pickles, blueberry jam, and cornbread will taste good to them. Especially at younger ages, experimentation and exploration are huge parts of learning. So relax and try not to comment even when their concoctions make you lose your appetite. Exploring food outside of dinnertime can often be less stressful and more fun. Books such as Lois Ehlert’s Eating the Alphabet and Growing Vegetable Soup are colorful and appealing as well as educational. Likewise, Amy Wilson Sanger’s adorable board books feature different cultural food traditions, which include Yumyum Dim Sum and Let’s Nosh. Out-of-the-house excursions can include trips to berry patches, orchards and working farms. …in your kitchen and out. Dining out can be stressful for parents, but it’s often worth it, both as a break for the family chef and as an opportunity for your family to get a glimpse of the tastes and traditions of diverse cuisines. While restaurants may add more salt or oil than you would generally use in your kitchen, the trade-off is that kids will have a chance to sample new and authentic cooking preparations and ingredients. Look for casual restaurants that seem kid-friendly and ask seasoned parents for suggestions — we’ve had great luck at Ethiopian restaurants where kids eat to eat spongy bread and other tasty veggie dishes with their hands, and at noodle shops where food is usually cooked quickly and a fish tank or other colorful decorations are on hand to keep little ones entertained. If eating out seems like more trouble than it’s worth, bring the world home with you. Have your kids plan a themed food night. Put on mariachi music, make or buy a piñata, and try out a new recipe for veggie quesadillas and homemade salsa. The dinner table becomes an inviting place when there are flowers (paper or real) on display, and everyone is sporting sombreros. Your little man or lady is unlikely to go from eating chicken nuggets and French fries to scarfing down edamame and brown rice overnight, but there are some things you can do to ease the transition. 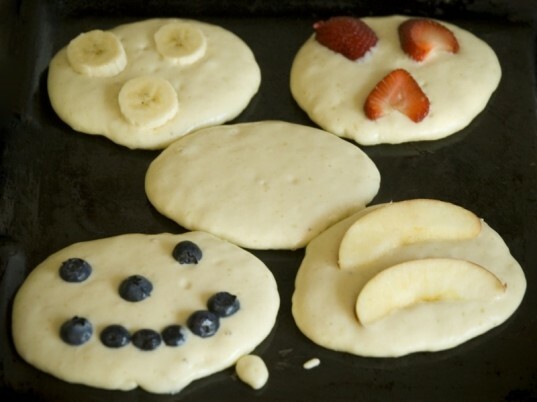 Make it fun: Put banana eyes and a maple syrup smile on those spelt pancakes. Get them laughing, and they will try something new much more happily. Keep trying new ways of preparing a certain food: They may not like carrots when they are sauteed but will love the sweetness and richness that roasting adds. Even varying the temperature at which a dish is served can really change how it tastes. Cutting new foods into small pieces is also helpful-they can nibble something that looks a little strange to them, and the smaller bites blend in with more familiar tastes. 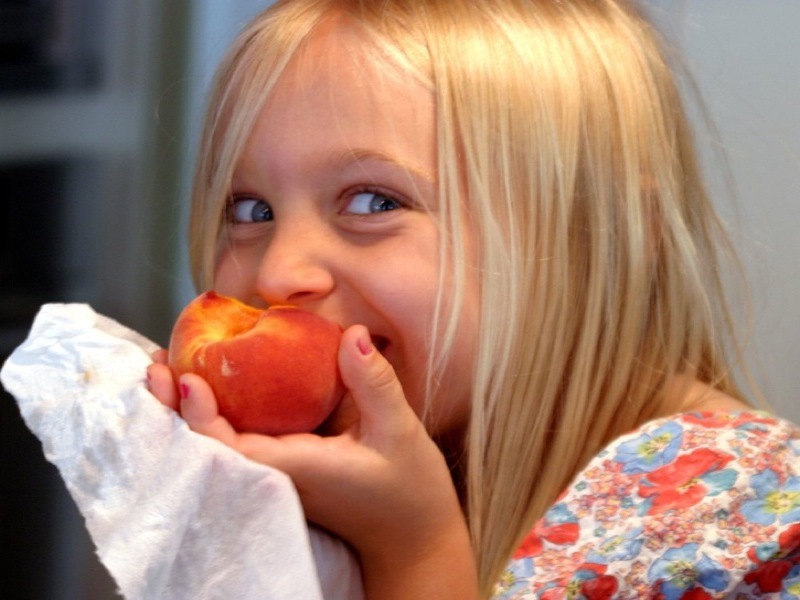 For super picky eaters, more extreme measures of deception might be in order. See Jennie Lyon’s recipes for sneaking veggies into smoothies. Books such as The Sneaky Chef and Deceptively Delicious have received a fair amount of backlash by parents who feel that “hiding” vegetables in food is sending the wrong idea. While I have been lucky to have a generally adventurous eater (who happens to love broccoli and who went on a pickled onion spree around his first birthday), I still use some of these recipes from time to time. I’m not hiding anything (especially since he’s there when I’m cooking our meals), and I’m all for any way to get more servings of fruits and veggies into our diet. Finally, don’t give up! What kids may hate this month could turn into their favorite food next month. 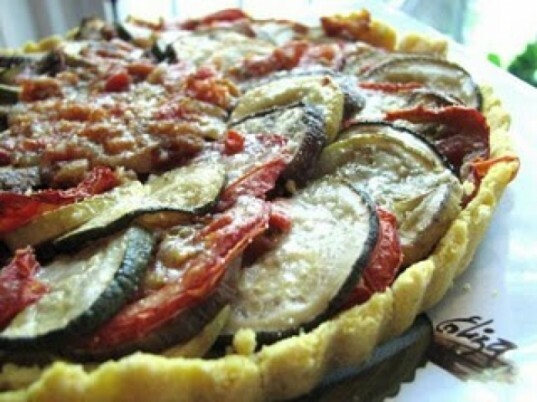 Just continue providing an array of healthy options and let them explore the wonderful world of food. Remember when your baby was still on a liquid diet, and she would sit at the table, looking enviously or curiously at your plate (and your mouth) at dinnertime? Well, she’s still watching you, so set a good example - cook new dishes and include ingredients that might not be your favorite either. My parents are not fans of beets so I never even tasted them until college. Tastes are always evolving so show your kids that you have a sense of food adventure, too. Your kid is not going to starve if you refuse to make her a grilled cheese sandwich on white bread. Again. Nutritionists and pediatricians agree that making a separate meal for your child that features only his or her “greatest hits” isn’t doing anyone a favor. And no one has ever gone through grilled cheese withdrawal. Don’t expect that your child will eat everything you give them, but give them a variety of healthy options and then let them choose. It’s simple, and you can spend the time you would have spent cooking them another meal, doing something fun together like coloring or staying a few extra minutes at the park. Set them up for success by giving them something you know they like and then let their bellies guide them. Of course, we make exceptions to this rule occasionally, such as when I'm cooking spicy food (which many little ones have a hard time digesting). Let’s be honest. Those naked, lonely stalks of steamed broccoli thrown on the plate aren’t fooling anyone. If vegetables are treated as an afterthought, kids sense it. My family is vegan, so vegetables are usually the stars of the meal by default. If you aren’t vegan or vegetarian, you can easily incorporate veggies into the main component of a dish -- think pot pie, lasagna, soups and chilis. The kids are still getting to eat their favorite foods, with an extra nutritional boost. Depending on your child’s age, this approach can look very different. Starting a garden, even just a tomato plant, is a great way to get your kid excited about growing his own food. Being a part of the “seed to table” process is very empowering for kids, and they are much more likely to try something that they've literally had a hand in growing. And don’t forget to include them in the actual cooking. My son loves being a “taster.” He doesn’t know the difference between basil and cilantro, but he loves shaking, stirring, and adding flavors to our dishes and then testing the final product. Make kids feel like they're a part of the whole cooking process (even if it’s just pressing the “on” button to the blender). A possible side bonus: They may gain appreciation for all the work that you do. If your child refuses to even take a bite of something, don’t push -- it’ll just become a battle of wits and it’s important for children to have control over their appetite. Instead, ask them what it smells like, if its shape reminds them of anything, even what it feels like. Even if no morsels pass their lips, they are developing a sensory palate that will eventually serve them well. You can make this into a game, too. Some foods (such as potatoes and cauliflowers or ricotta cheese and blended tofu) mimic each other in texture or taste. Try swapping them out in old favorites and see if kids can taste the difference. 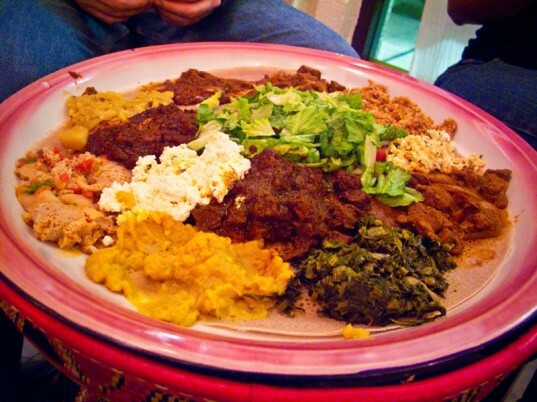 Look for casual restaurants that seem kid-friendly and ask seasoned parents for suggestions -- we’ve had great luck at Ethiopian restaurants where kids eat to eat spongy bread and other tasty veggie dishes with their hands, and at noodle shops where food is usually cooked quickly and a fish tank or other colorful decorations are on hand to keep little ones entertained. If eating out seems like more trouble than it's worth, bring the world home with you. Have your kids plan a themed food night. Put on mariachi music, make or buy a piñata, and try out a new recipe for veggie quesadillas and homemade salsa. The dinner table becomes an inviting place when there are flowers (paper or real) on display, and everyone is sporting sombreros. For super picky eaters, more extreme measures of deception might be in order. See Jennie Lyon's recipes for sneaking veggies into smoothies. Books such as The Sneaky Chef and Deceptively Delicious have received a fair amount of backlash by parents who feel that “hiding” vegetables in food is sending the wrong idea. While I have been lucky to have a generally adventurous eater (who happens to love broccoli and who went on a pickled onion spree around his first birthday), I still use some of these recipes from time to time. I’m not hiding anything (especially since he’s there when I’m cooking our meals), and I’m all for any way to get more servings of fruits and veggies into our diet.